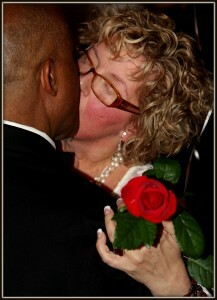 I want to extend a huge, happy congratulations to Linda Rossi and Serge Ouattara. They were married yesterday surrounded by their many friends and loved ones. I don’t remember exactly when I met Linda, but I know it has been at least 10 years. She is just the most wonderful person. She and I have shared our real estate journey, but we have also shared our personal journey. We were Realtors during the great recession, we both faced serious health issues, we both raised sons who are nearly the same age, we have seen each other stay steadfast and strong. Serge came into Linda’s life about 3 years ago (forgive me Linda if I don’t have the time lines exactly right). From the day she met Serge there was a spark of something special. Serge is a wonderful man and he has brought joy into Linda’s life. I am just thrilled for the two of them. So congratulations Linda and Serge. Here’s wishing you a lifetime of friendship, love, and laughter.